This past weekend was the start to the college swimming conference championships. As yards swimming continues to progress, we are fortunate to frequently see the best yards swims of all-time. This weekend started with a boom as Caeleb Dressel went the fastest 200 IM yards race in history. If you missed the 100 fastest 100 yard breast in history, check this analysis out. Lets breakdown the fastest 200 IM in yards history and compare it to some of the long course World Records and top swims. Like always, Caeleb has a great start, hitting the 15-m mark at 5.0 seconds (faster than his 100 breast 0-15-m, as expected). He takes roughly 1 stroke to the 15-m mark. This puts his velocity at ~3 m/s. Dressel took 3 strokes into the wall, totaling 4 strokes for the first 25. He hits the wall in ~9.2 seconds. Utilizing his amazing underwater dolphin kicks, Dressel breaks out just before the 15-m mark at 6.33 seconds. His time to 15-m is 7.53 seconds and he takes 1 stroke again over this distance. Very well paced, Dressel closes the 2nd 25 of fly in ~4.1 seconds, which is nearly identical to his first lap. He took 4 strokes over this distance. 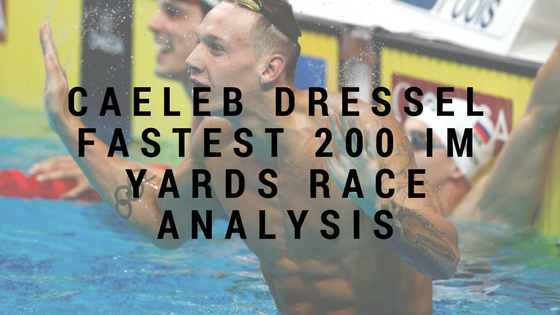 The first 50 yards Dressel went 21.03 seconds on his way to the fastest 200 IM (in yards). He took a total of 9 strokes. On his weakest stroke, Dressel began his backstroke with a long bout of underwater dolphin kicking, breaking out at 6.66 seconds. He took took strokes before hitting the 15-m mark at 7.76 seconds. Into the wall, he finished in 5.36 seconds, a velocity of 1.6 m/s. He took a total of 6 strokes and had a distance per stroke of 1.43 meters/stroke. On the fourth 25, Caeleb broke the surface in 5.6 seconds and hit the 15-m mark at 7.15 seconds. His velocity was 1.57 m/s (compared to 2.07 m/s on his 2nd 25 butterfly leg). He took 2 strokes over this distance. Finishing the 2nd 50 yards, he closed in ~5.4 seconds. He took 7 strokes over this distance. With backstroke being his weakest stroke, he still split 25.01 seconds. Although this was 0.7 seconds slower than David Nolan's previous record, it was still quick considering it is his worst stroke. Dressel took 4 strokes over this distance, swimming it in 5.53 seconds. Continuing his consistency on breast, Dressel breaks the surface at ~7.0 seconds and takes one stroke to ~8.4 seconds at 15-m mark. He closes in ~8.4 seconds, maintaining his 4 strokes into the wall. Nearly outsplitting Nolan's race by 1 second, Mr. Dressel swims a blistering 28.37 seconds on his breaststroke leg. He took 10 total strokes [similar to his 100 breast stroke count]. On the freestyle leg, Dressel reduces his time underwater and only spends ~4.2 seconds to break the surface. He swam 6 strokes to the 15-m mark in ~7.7 seconds. He took another 6 strokes into the finish. He swam approximately 12.5 seconds over this leg. On the final lap, Dressel popped up even earlier (at 3.33 seconds) and took 6 strokes until the 15-m mark at ~7.4 seconds (hard to get this time, the camera angle was off). He took 7 strokes into the wall finishing the lap at ~4.2 seconds and at 11.6 seconds for the 25. His freestyle leg was blistering, finishing in 23.72 seconds, much faster than Nolan's previous record (24.18). An amazing swim once again by Mr. Dressel. This time puts him over a second again for the next fastest time! Amazing start. He was able to get off to a blistering speed and split 21.03 on his fly leg, much faster than any other swimmer. Low stroke count. 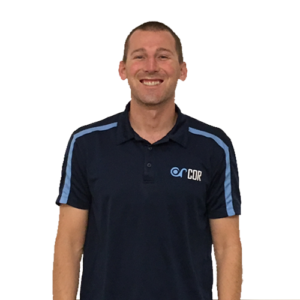 He was able to keep his stroke count down and reduce the amount of overall stress by focusing on his underwaters and turns (as he often does, just using the legs will create less metabolic waste than whole body swimming). Consistency between all the strokes. Although his backstroke leg was his weakest, it wasn't too far off Nolan's split or other great backstroke swimmers who did 200 IM. Time for some fun, how can Dressel improve the fastest 200 IM yards of all-time? Improve backstroke dolphin kicks. If he could improve his backstroke dolphin kick speed and spend a tad more time underwater, he may be able to split ~24.75 seconds without expending too much more energy. That's about all I can suggest at this time. How else do you think he could improve his fastest 200 IM swim? No breath on the last 25 of the free leg?